FRIENDLY AND RELAXED ATMOSPHERE with Lynda & Rod, your onsite managers. Conveniently situated in a quiet court on the beautiful Fishpen Peninsula, near shops and parklands. Ours is a family friendly complex where good old fashion service is paramount. 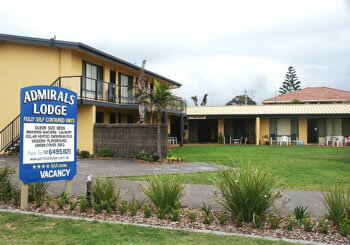 Admirals Lodge offers excellent value for money accommodation. Our AAA rating is 3� star. All units are presented in a spotless condition and include a TV/DVD player. The master bedroom has a Queen size bed & 2nd bedroom has a single bed plus a double bunk - all with doonas and electric blankets on the master. Units 6 & 7 upstairs are North facing to catch the Winter sun and have lovely views of the Merimbula Lake and Township. Each room has its own parking space, with room for boats and trailers.